A group of Maryland officers delivered some holiday cheer to an 11-year-old boy who is recovering after a family friend accidentally shot him. Caleb Harry was shot in Suitland, Maryland, on Dec. 5. A man who is friends with Caleb's father was watching him and the man was putting away his weapon when it went off, shooting Caleb in the chest. "I remember falling to the ground. Passing out," Caleb said. "And then closing my eyes, waking back up in a hospital bed." After having multiple strokes, heart surgery and brain surgery, Caleb is back home recovering and playing video games. "For him to be actually walking around 17 days later, you know, no one can ever wish that, you know, so it's a joy," Mark Harry said. 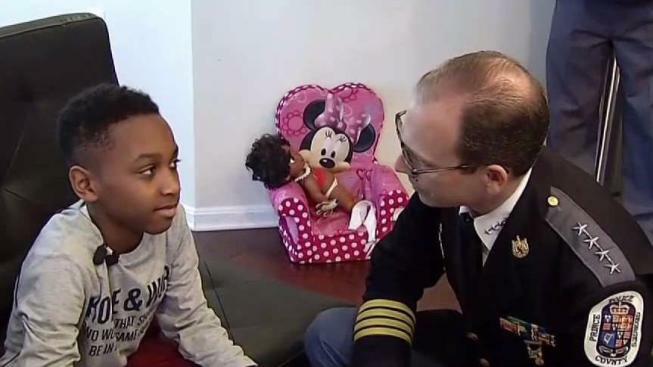 On Thursday, Caleb got a surprise when Prince George's County Police Chief Hank Stawinski and a large group of officers came to his house with a pile of gifts. "We were worried about you," Stawinski told Caleb. Caleb said he had no hard feelings toward the family friend who shot him. "He's a good friend and he didn't mean to do it. And he's the one who got me the Play Station," he said.